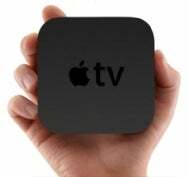 This Apple TV has two unexpected things going for it—the $99 price tag and its AirPlay feature, which allows you to stream content from an iOS device to the Apple TV (and thus, your connected TV). Considering that Apple charges $49 for composite and component cables that let you play video from an iPod, iPhone, or iPad on your TV, this is quite a bargain. You couldn’t be much more accurate than “…I have to think that the iPod classic has reached the end of the road.” (If you ignore the “If Apple allows streaming” that precedes that statement.) Apple continues to sell the iPod classic for $249, but it hasn’t been updated and merited not a single mention from Steve Jobs. The writing is on the wall. It’s going the way of the dodo.